Under the authority of the Controlled Substances Act of 1970, the Drug Enforcement Administration (DEA), Office of Diversion Control (OD) regulates the manufacture and distribution of controlled substances in the United States. This regulatory control is designed to prevent the diversion of legitimate pharmaceutical drugs into illegal channels and to ensure that there is a sufficient supply for legitimate medical uses. The DEA’s CSOS program allows for secure electronic controlled substances orders without having to complete the supporting paper DEA Form 222. Using a technology called PKI, CSOS requires each individual purchaser to enroll with the DEA to acquire a CSOS digital certificate. Faster Transactions: CSOS Certificates contain the same identification information as DEA Form 222, allowing for timely and accurate validation by the supplier. Faster transactions allow for just-in-time ordering and smaller inventories. Decreased Cost: Order accuracy and decreased paperwork result in a lower transaction cost. Before you can use Letco’s CSOS to order Schedule II items, you must first obtain a CSOS Certificate from the DEA. A CSOS Certificate is a digital identity issued by the DEA and is the digital equivalent of the identification information contained on a DEA Form 222. Log onto the DEA’s e-commerce website and follow the on-screen instructions: http://www.deaecom.gov/applycert.html. How Long Will it Take to Receive my CSOS Certificate? You should receive your CSOS Certificate activation notice within thirty days of submitting your complete DEA application package. Incomplete, inaccurate, or invalid application packages will take longer to process and may be denied and returned by the DEA. E-mail: The DEA sends Activation Notices via email to applicants upon approval. Using special software built into this website and your electronic CSOS Certificate from the DEA, you can electronically ‘sign’ for your order. Also, if your order is placed by 5:00 PM Eastern Time, it will ship the same day. 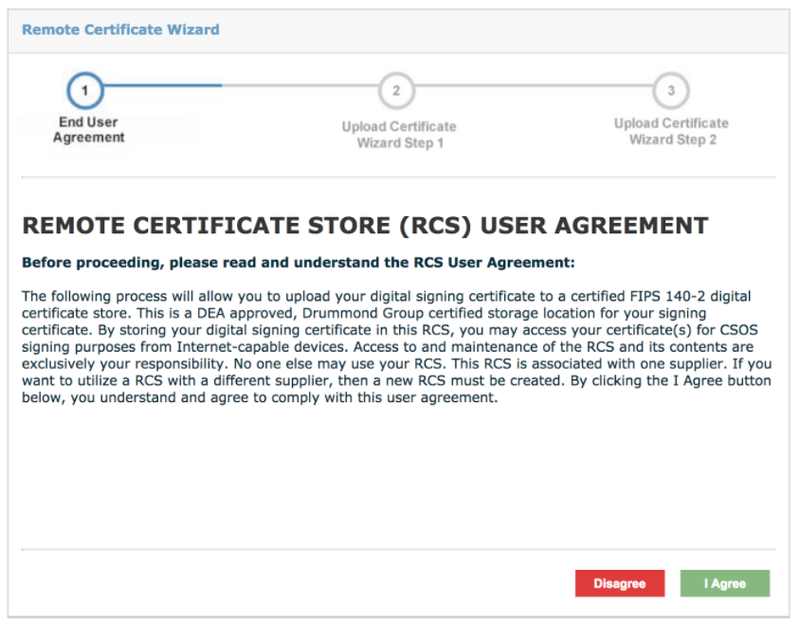 When signing an order in CSOS for the first time, you will be routed to the ‘Express 222 Remote Certificate Store’ Remote Certificate Wizard at and presented with a User Agreement. You must agree to the terms of the User Agreement before you can use CSOS by clicking the ‘I Agree’ button. Once you accept the terms of the User Agreement, you should see a DEA certificate upload selection screen. Click the Choose File button to locate the .pfx or .p12 DEA-issued signing certificate. The system will load the customer DEA number for review. After confirming the DEA number is correct, the customer enters the corresponding certificate password and clicks Next. The final step of the process is creating a new order signing password and security question. 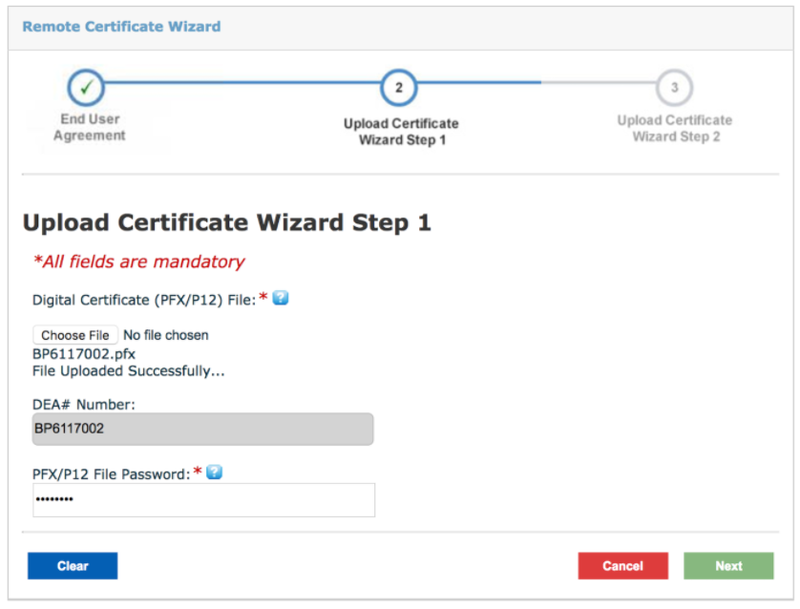 The new password will be used to sign future orders and to make changes to certificates stored in the Remote Certificate Store, and it may be different from that used to access the signing certificate or to sign into the Letco Medical website. The password chosen for the certificate store must meet minimum strength requirements, described by a tooltip shown by hovering over the corresponding ? icon. Customers enter a new password twice for confirmation, then choose a security question and answer for password reset purposes. When complete, customers click the Finish button. 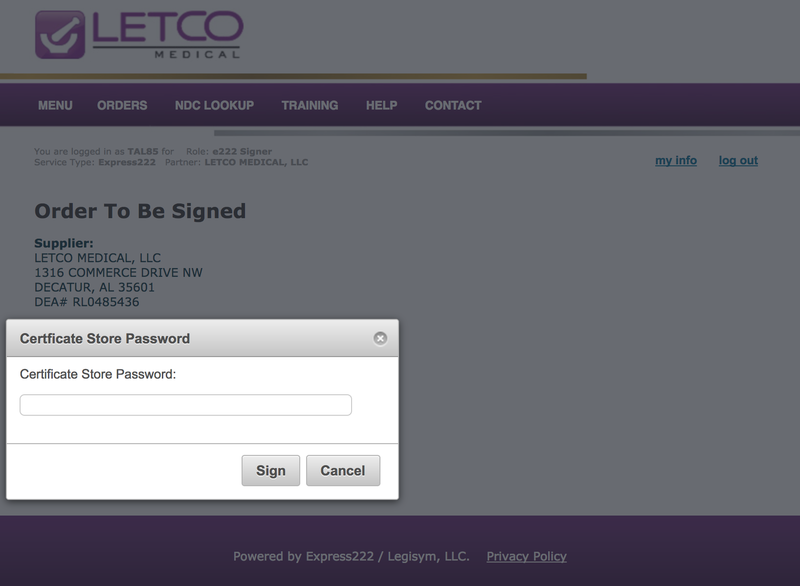 The order signing page displays the order to be signed in the background while prompting for a Certificate Store Password. 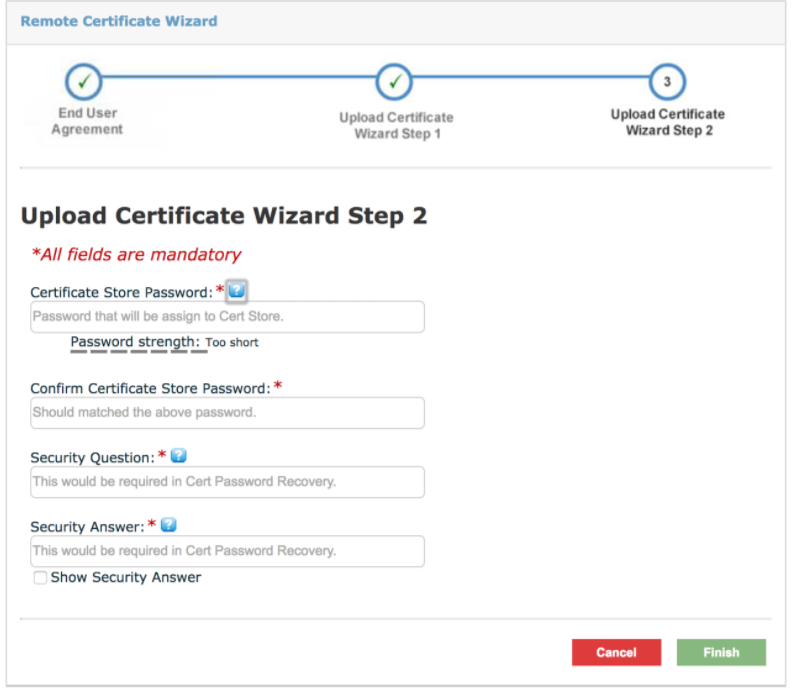 Customers should enter the password selected in the Upload Certificate Wizard Step 2. After successfully signing the order, the system routes to an order confirmation page, which provides links to view the e222 form and to visit the CSOS Order History page. Customers may view completed orders and pending orders on the CSOS Order History page under My Account. This section displays successfully signed CSOS orders, with links to order details, the e222 form, and after orders are shipped, receipt confirmation. This section displays any CSOS orders which have been placed but not yet electronically signed. Customers may resume the order signing process or delete the order. After shipment, customers may confirm receipt of CSOS orders by clicking the Confirm Receipt link next to the corresponding order. On the Confirm CSOS Order Receipt page, customers may enter the receipt date and the quantity received for each line item. In the event of receipt discrepancies, customers provide a comment to assist in compliance review. To complete the process, customers click the Confirm button. Stored received quantities are displayed on the e222 form. 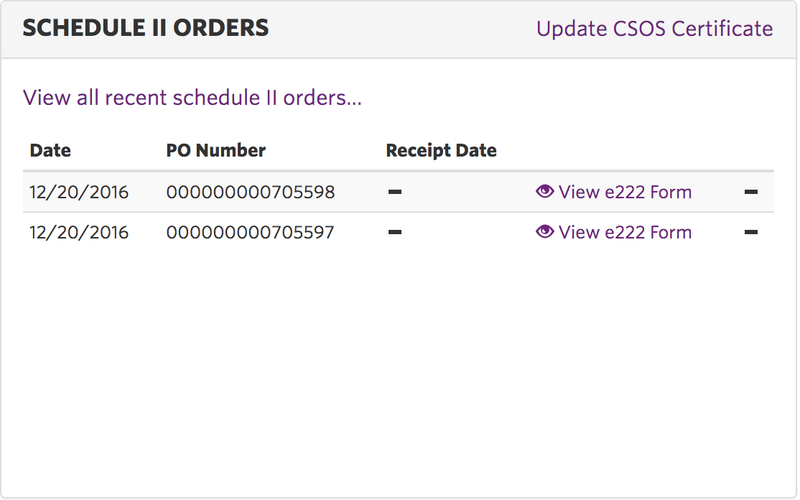 To view the e222 Form for a CSOS order, a customer simply clicks on the View e222 Form link next to the corresponding order on the Order History page. 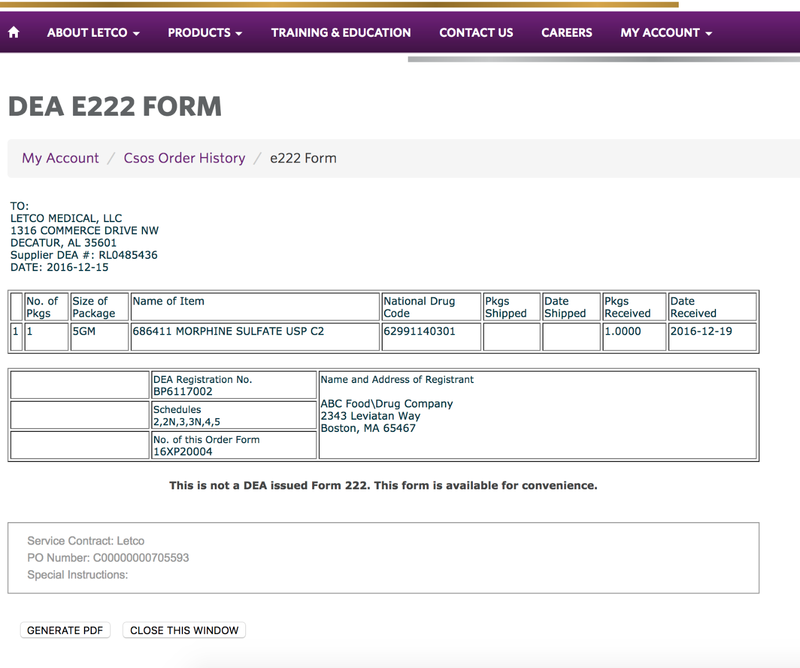 Customers may export a PDF of the e222 Form by clicking the Generate PDF button.